These two seemingly different crops have similar requirements. And they really aren't so different in the way they are used — the leaves of beets are eaten just like chard after the beet roots have been harvested. Italian chards are especially sweet. Chard Verde da Taglio has thin stems and smooth leaves; it makes a perfect substitute for spinach during the summer. Costa Bianca has a much thicker stem and crinkly leaf. You can cook the leaves and also braise the stems separately. Our Chioggia beet, with its red-and-white stripes, is descended from sugar beets and is very, very sweet. When cooked it does not ‘bleed’ like many beets. The tops are very tasty and are good cooked by themselves or with pasta. Culture. 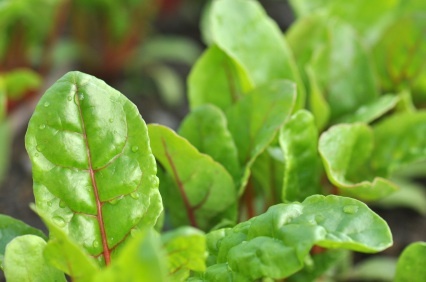 Beets and chard should be planted in a fertile, well-drained soil with a pH over 6.0 and good fertility. Plant beginning four weeks before the last frost date, one seed per inch, ½ inch deep in rows 12” apart. Thin to one plant every 6" for chard; one every 4-6 inches for beets. Provide an adequate and continuous supply of moisture. Both do well from transplants. For transplants, seed 1-2 seeds per cell 6-7 weeks before set out date. You can thin to one plant per cell, or just put them all out. Either way works fine. Set out plants three weeks before the last frost date. They will take a frost down to about 20°F; however, if you can grow them under row cover or vented plastic tunnels, you can grow them much earlier and later in the year. Keep well-weeded and provide plenty of water. Beets sometimes get ‘corky’ on the top. Prevent this by hilling up soil over the top of the bulb when you are weeding. Make succession plantings of beets every 3-4 weeks. For best quality chard, make succession plantings every 7-8 weeks. Both will survive a heavy frost in the fall. Verde da Taglio is very cold hardy and should survive until temperatures get in the teens. It will survive all winter in an unheated greenhouse since it is the snow, ice and dry wind that kills the plant, not cold. Diseases and pests. Not much bothers beets or chard. The exception is leaf miners which favor beet & chard tops. Damage is, for the most part, cosmetic for mature plants. Control leaf miners by using light weight remay cloth before the leaf miners appear in the spring. You can also control them with rotenone or pyrethrum. Harvest, storage and use. With chard you can either pick outer leaves or cut the entire plant about 3-4 inches from the soil line and the plant will regrow. You can usually get two and sometimes three full cuttings. As soon as you harvest it, wash it and store in a plastic bag in the refrigerator. For beets, pull, wash and store in the crisper. Cook the tops separately; they are delicious. Cook chard by itself in a little olive oil & garlic or cook with pasta. See the recipes in "Cooking Italian" for suggestions.